Roll out pastry and cut into long strips, 8cm wide. Removes sausage meat from the casings, place in a bowl and add a splash of Worcester sauce and/or a few finely chopped sage leaves. Mix well with a fork. Flour your hands, and form the sausage meat into sausages shapes the length of the pastry strips. Place them on one side of the pastry. Dampen the long edge of the pastry and close the pastry over the meat. Seal well. 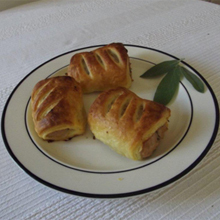 Brush with glaze, Make small knife cuts along the top and cut sausage rolls to size. Place in Remoska and bake for 20 minutes. 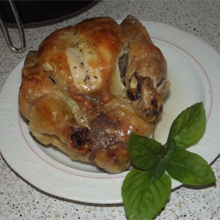 Cut butter into small pieces and insert under the skin of the chicken. Brush chicken with oil and sprinkle with salt and pepper. clear when pierced with a skewer. Place pastry shell in Remoska and bake blind for 10 minutes. Remove baking beans and bake a further 5 minutes until pastry is golden brown. Remove from Remoska and set aside to cool. Combine condensed milk, lemon juice and rind and egg yolks and mix well until smooth. Spoon mixture into the pastry shell. Beat the egg whites and gradually add in the caster sugar. 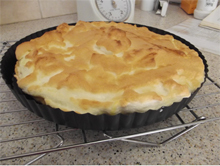 Cover the lemon filling with the meringue and cook in Remoska for about 10 minutes. Mix the filling ingredients together in a saucepan and simmer for 5 minutes. Drain off excess juice. Set aside to cool. In a large bowl, beat together margarine and sugar. Add egg and beat well. Sieve together the dry ingredients and add to mixture to form a soft dough. Press half the dough into a greased 23cm pie dish. Spoon filling on top. Coarsely grate the rest of the dough over the filling. Bake in the Remoska for 1 hour. Serve hot or cold. Cook potatoes in boiling salted water. Drain and slice. 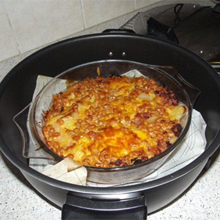 Place a layer of potatoes in the greased Remoska pan (or in any casserole dish). Stir mustard into baked beans and spread a layer over potatoes. Place a layer of streaky bacon and cheese on top of beans, and continue in layers until ingredients are used, finishing with cheese. Melt butter in saucepan, stir in flour, and cook for 1 minute. Gradually add apple juice and milk, stirring continuously. Bring to the boil, and simmer for 2 minutes. Season to taste. Stir in the diced chicken and carrots. 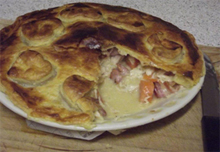 Turn into a 1L pie dish. Remove rind from bacon, spread each rasher flat, cut in half and roll up. Grill it lightly and add to pie. Beaten egg and milk to glaze. Wash and scrub potatoes, prick with a fork and place in Remoska to bake for 1 hour. When done, cut in half and remove scoop potato out of the skins. Fry the onion and bacon bits together. 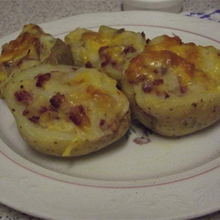 Place in a bowl with the potato and 125g of the cheese mix well. Peel, wash and rinse potatoes, cut into quarters and pat dry with paper towels. Add a little salt to the oil then toss in the oil until they are well coated. Add the thyme. 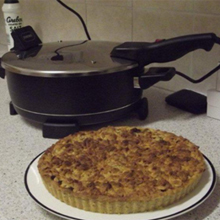 Bake in the Remoska for 30 – 40minutes until golden brown, crisp on the outside and tender inside. 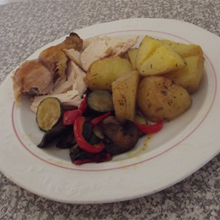 Serve with Remoska Roast chicken. Send us your own recipes to add to the Recipe page.